Iran has slammed an "unconstructive" move by the Netherlands to deport two Iranian embassy staffers, saying the Islamic Republic reserves the right to take a reciprocal measure, PressTV reported. "The Islamic Republic of Iran regards this decision as an unconstructive measure in relations between the two countries," Iranian Foreign Ministry Spokesman Bahram Qassemi said on Saturday. A spokesperson for the Dutch intelligence service AIVD on Friday said that the country had expelled two "persons accredited to the Iranian embassy" but refused to provide any further information. According to a European government official and a Western intelligence source, the expulsions occurred more than two months ago. Dutch state broadcaster NOS said the expulsions were on June 7. Qassemi said following the expulsions, the Iranian foreign minister’s special assistant in political affairs summoned the Dutch ambassador to Tehran to express Iran's protest over "this unfriendly move." "The Islamic Republic of Iran calls for the maintaining and expanding of relations with all countries based on goodwill and mutual respect," he added. As a victim of terrorist acts, Iran “once again reaffirmed its core stance on a firm and non-discriminatory fight by all members of the international community against terrorism," the spokesperson pointed out. He criticized the Dutch government's illogical and illegal move and said Tehran expected the country's officials to stop leveling unfounded allegations against others and to fulfill their international obligations instead to arrest and punish terrorist agents, particularly those for whom Interpol has issued a "red notice." 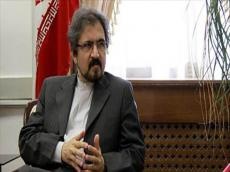 Qassemi also called on Dutch officials to give an explanation for their country's move to shelter members of the notorious anti-Iran terrorist group the Mujahedin Khalq Organization (MKO), which has the blood of many Iranians on its hand. The Netherlands' move came after Belgian authorities said on Monday that an Iranian diplomat had been arrested along with a 38-year-old man and a 33-year-old woman, suspected of plotting a bomb attack on an MKO meeting in the French capital Paris attended by US President Donald Trump's lawyer, Rudy Giuliani, and several former European and Arab ministers. They added that Belgian police had intercepted the two suspects in Belgium on June 30 with 500 grams of the homemade explosive TATP and a detonation device found in their car. Iran's Foreign Minister Mohammad Javad Zarif denied any Iranian involvement in any plot to blow up the MKO meeting and said on Monday the arrests constituted a "sinister false flag ploy." Taking to his official Twitter account, Zarif said, "How convenient: Just as we embark on a presidential visit to Europe, an alleged Iranian operation and its 'plotters' arrested." Heading a high-ranking politico-economic delegation, Iranian President Hassan Rouhani paid a visit to Switzerland and Vienna this week and held talks with senior officials of the two European countries. On Tuesday, Qassemi said the MKO was behind the "baseless and unfounded" plot against the Iranian diplomat arrested over allegations of involvement in the Paris bomb attack. He added that the allegations about the involvement of the Iranian diplomat in the suspected bomb attack on the MKO meeting were designed at the current sensitive and important juncture to damage Iran-Europe relations.